Are you a 3rd year bachelor student who wonders how to enhance your employability? Do you want to enlarge your awareness of your core competencies, skills and natural talents? What comes naturally to you without any effort, what gives you energy and motivation? What will you bring to a future work place? 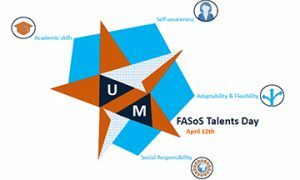 Come and find out at our UM-FASoS Talents Day on 12 April. Please register online. A key-note speech by a FASoS alumna who will share insights on how to enter and become successful on the labour market after your studies. What challenges can be expected and how to overcome them? After the key note speech it is time for you to get into action in small teams. You will take part in a set of assignments which will reveal your talents and strengths. You will perform different tasks while observers from the working field and from UM Career Services and UM Psychologists will follow your actions. At the end of the afternoon, you will get personal feedback on your efforts, aimed at helping you to recognise your talents. You will walk away with a better insight into: What do you bring to a work place? What should you definitely highlight in a job interview? What are you good at without even realising it? Make sure you register as soon as possible. There is a limited amount of seats available for this unique event; first come, first served. Registration closes on 29 March. Once you have registered, you will receive an email with assignments to prepare before the event. If the topic of employability is interesting for you, you are warmly invited to the FASoS Career Orientation Day on Saturday 13 April when FASoS alumni from all FASoS educational programmes will deliver inspiring lectures, workshops and Q&A sessions.